Like many other web sites, we actively collect information from our visitors both by asking specific questions on this site and by permitting you to communicate directly with us by submitting your enquiry, and via e-mail. Some of the information that you submit may be personally identifiable (that is, information that can be uniquely identified with you, such as your name, address, e-mail address, phone number, etc.). We use this information to send you further information regarding Strat Team. You are not obliged to accept a cookie that we send to you, and you can in fact modify your browser so that it will not accept cookies. If you do decide to disable cookies you may not be able to access all areas of our website. For more information about cookies including how to set your internet browser to reject cookies please go to www.allaboutcookies.org and www.networkadvertising.org/choices. 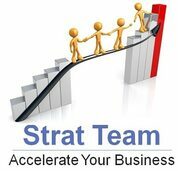 Strat Team uses your personal information to enhance the operation of this site, allow you to use all of its features and respond to your requests for information. Strat Team may contact you about new features or services in which it believes you may be interested, either directly or through third party vendors . We may disclose any information we deem necessary, in our sole discretion, to comply with any applicable law, regulation, legal process, police or governmental request. You may send us an e-mail message at info@stratteam.com to request to correct or delete any personal information that you have provided to us. You may also opt out of receiving marketing messages from Strat Team by notifying us at info@stratteam.com. Strat Team has reasonable security policies and procedures in place to protect personal information from unauthorized loss, misuse, alteration, or destruction. Despite Strat Team's best efforts, security cannot be absolutely guaranteed against all threats. To the best of our ability, access to your personal information is limited to those who have a need to know. © 2013 Strat Team Advisors, Gurgaon, India.